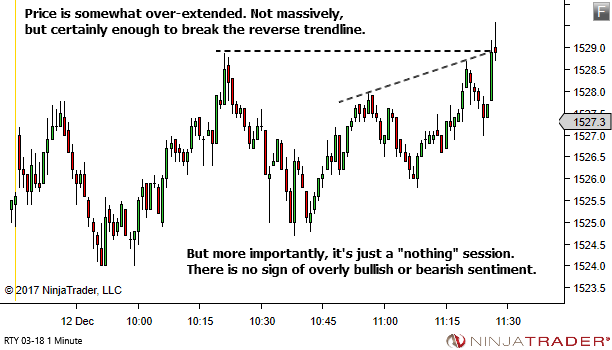 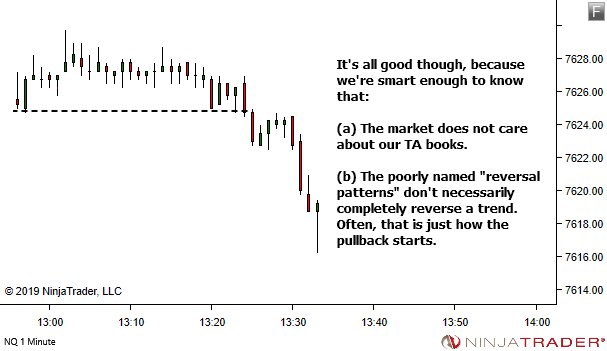 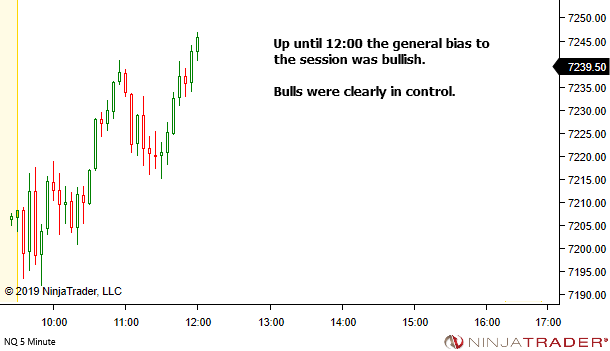 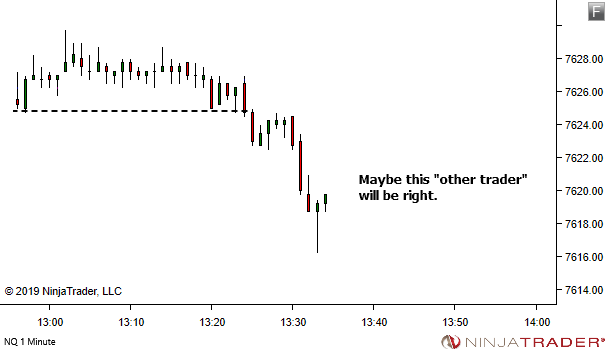 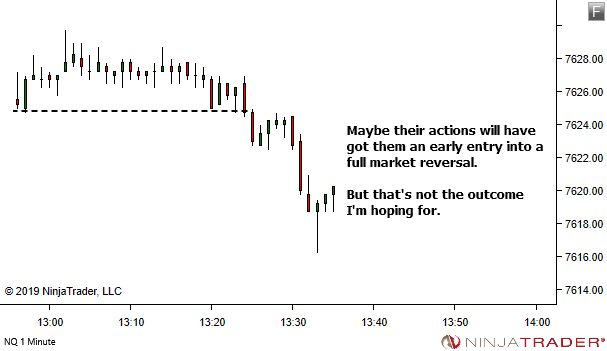 Take note when the market offers something that many traders will see as obvious. 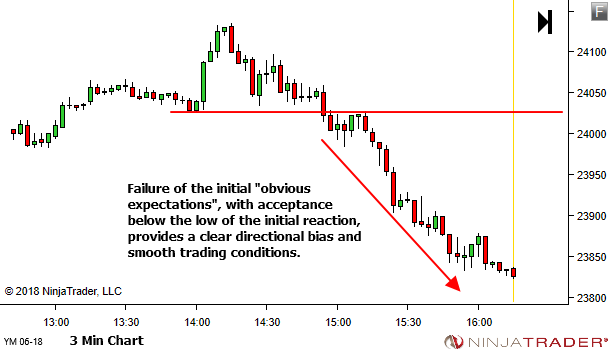 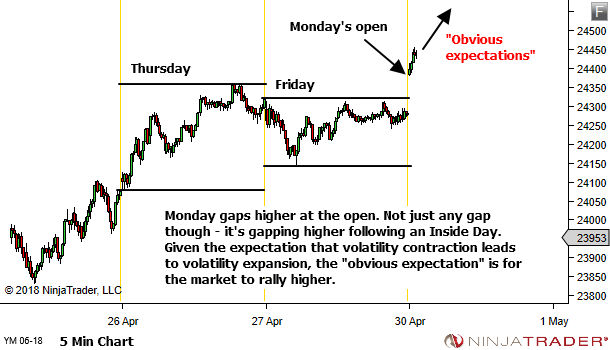 Because when "obvious expectations" fail, you will often find a clear directional bias and good trade opportunity in the opposite direction. 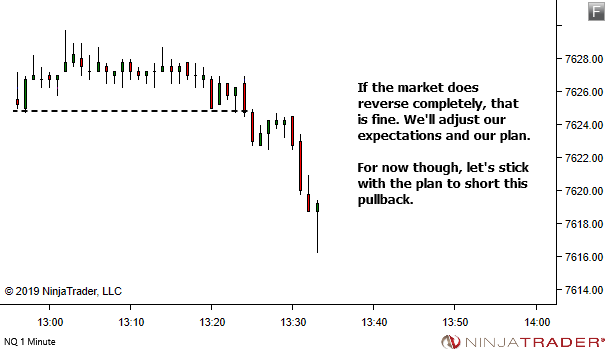 And that is a quite reasonable expectation. 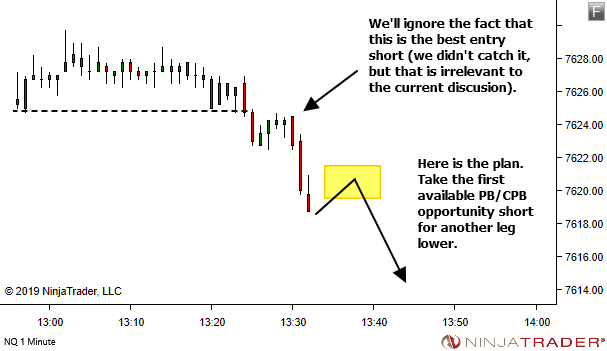 You SHOULD be seeking opportunity LONG. 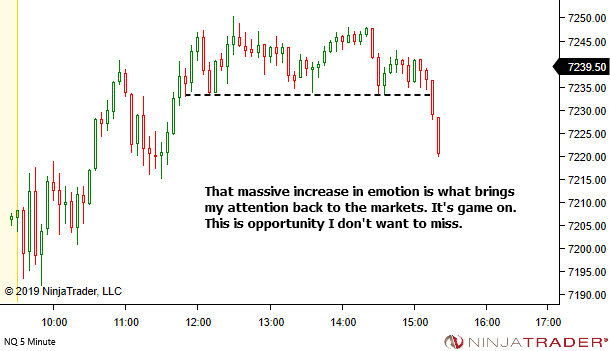 At least until the market proves otherwise. 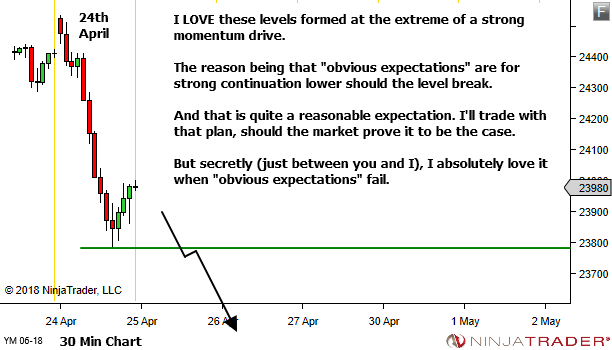 For me though, I always take note of anything I consider to be an "obvious expectation". 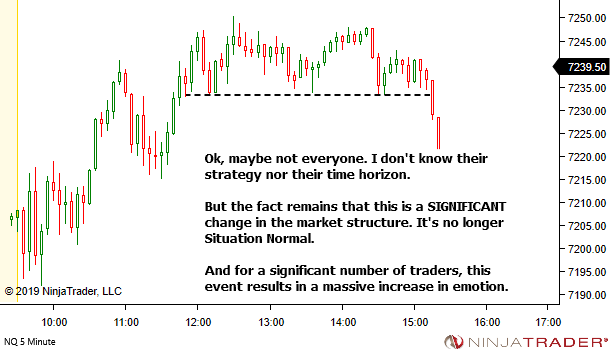 Because I also know that there is no certainty in the markets. 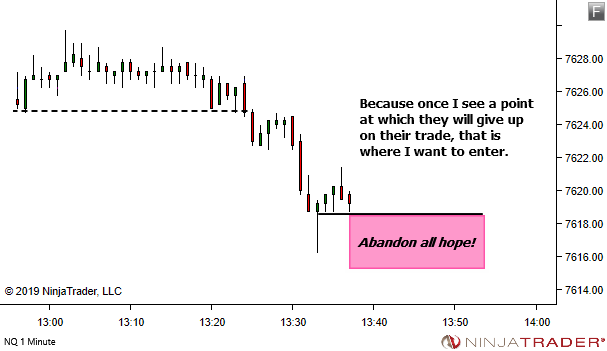 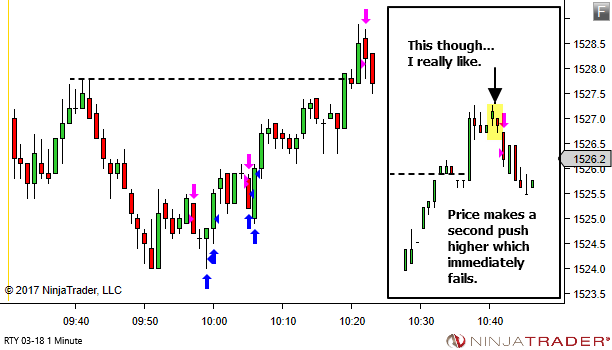 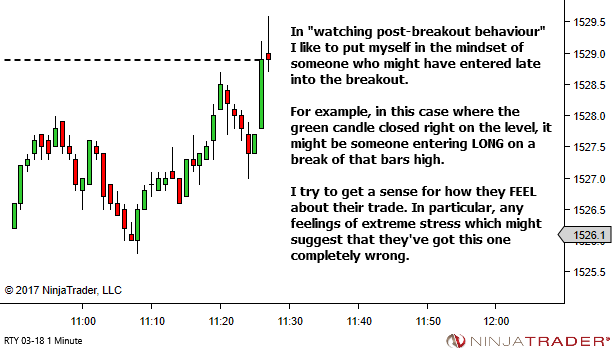 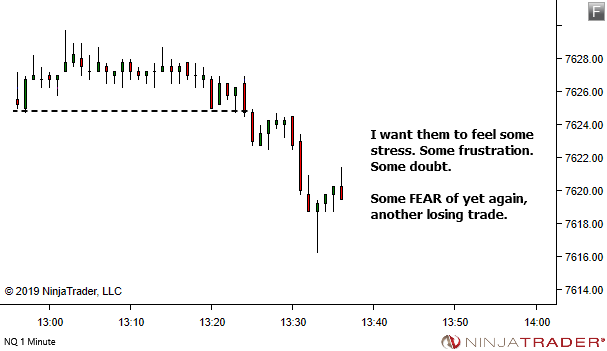 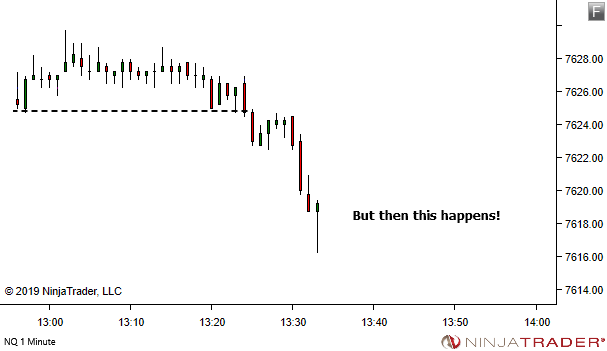 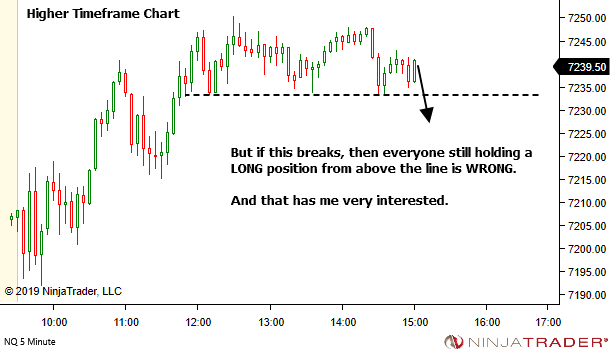 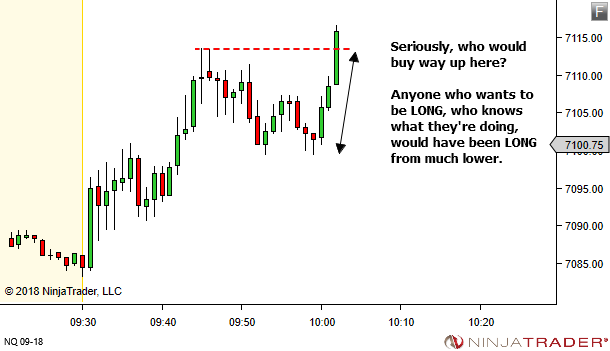 And when obvious expectations fail, that often provides some of my favourite trading conditions in the other direction. 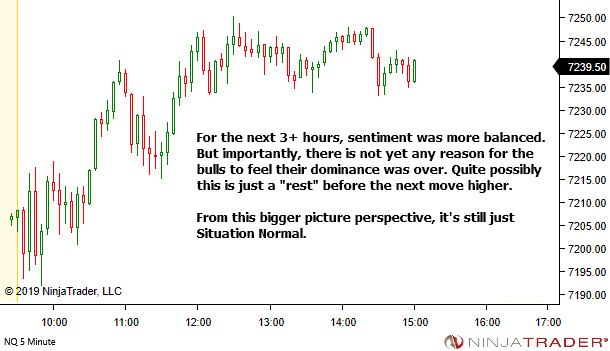 Let's say we have a market with a clear bearish bias. 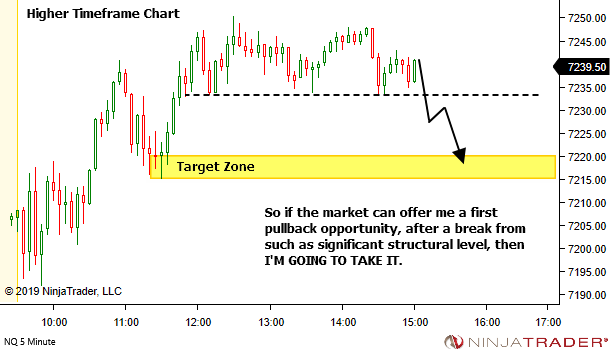 Price then pulls back higher and reaches an area in which I'd be happy to enter a SHORT position. 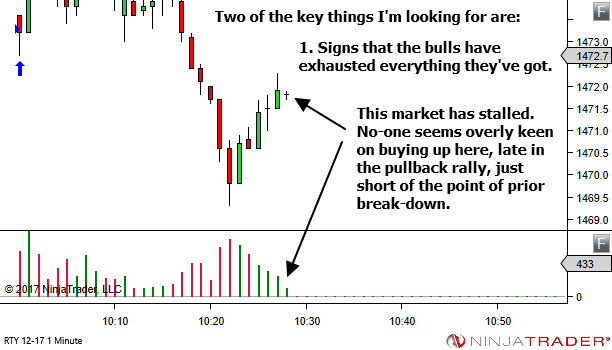 Signs that the bulls have exhausted everything they've got. 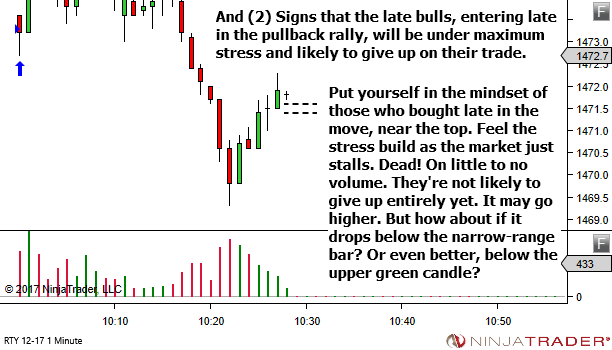 Signs that the late bulls, entering late in the pullback rally, will be under maximum stress and likely to give up on their trade. 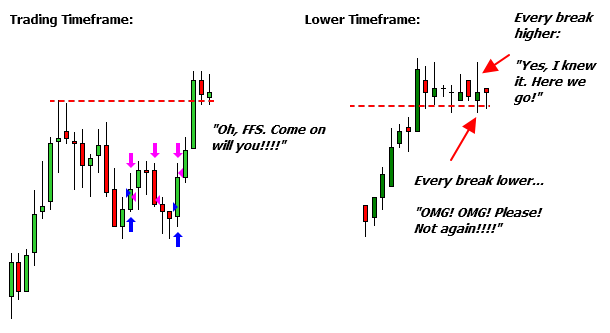 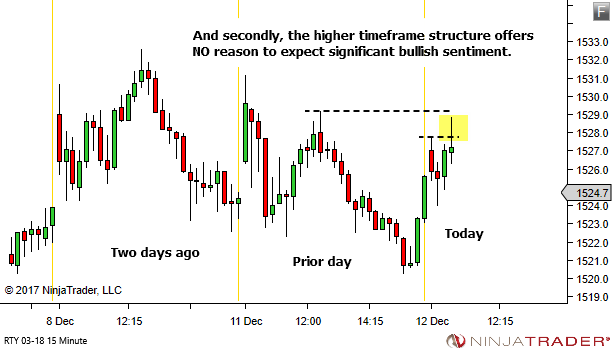 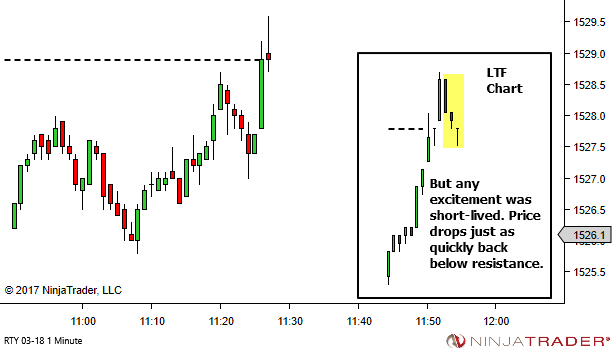 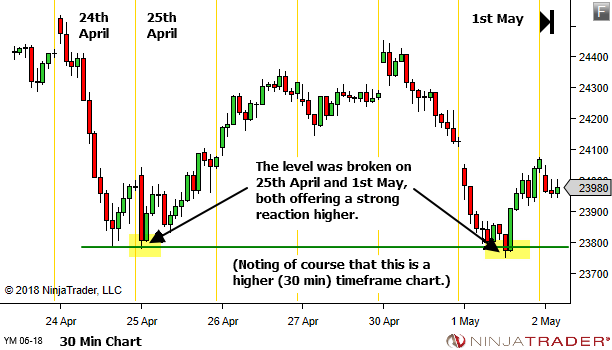 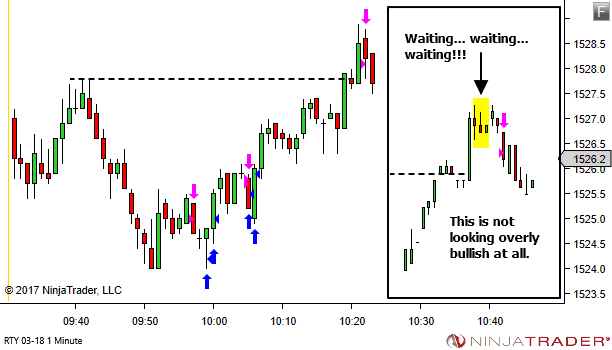 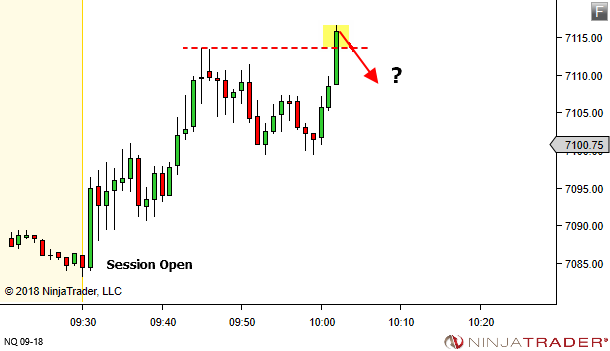 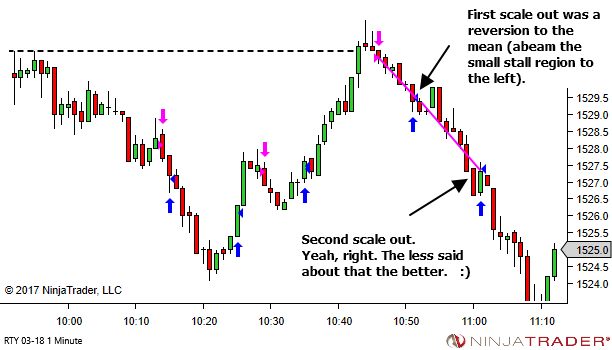 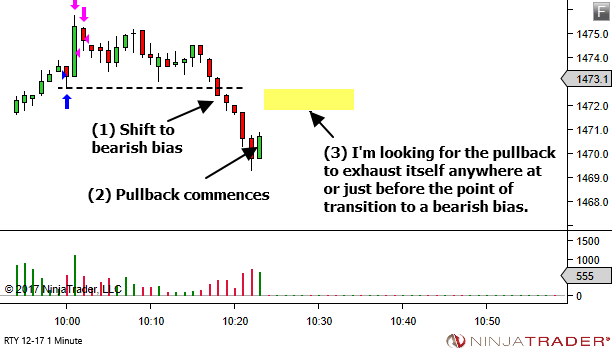 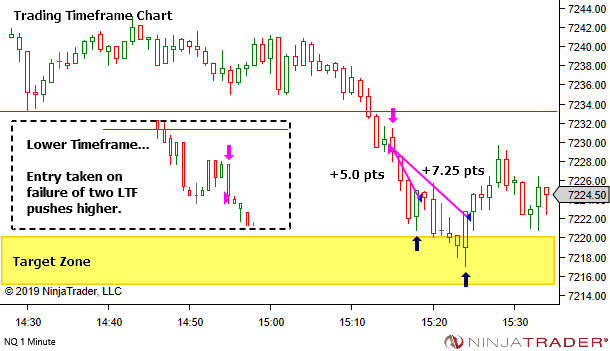 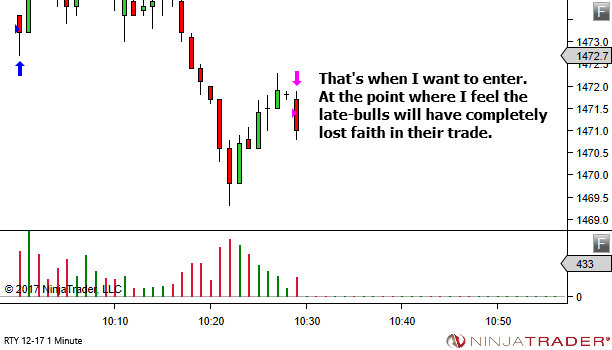 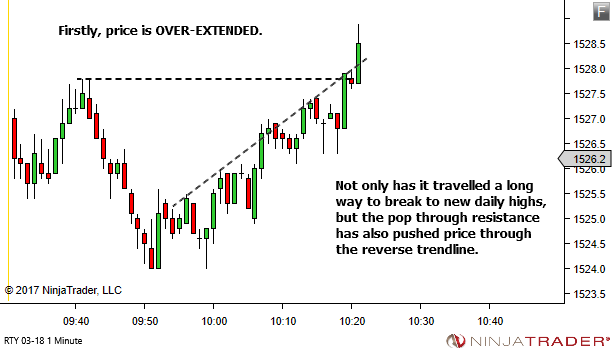 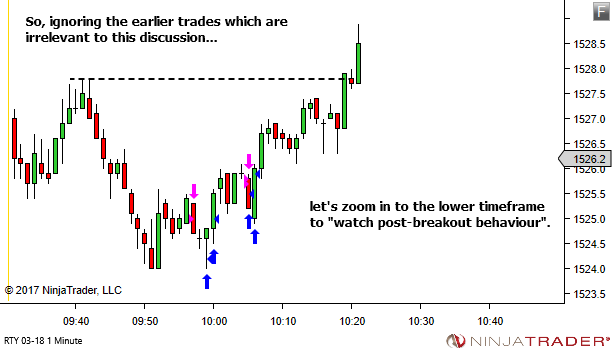 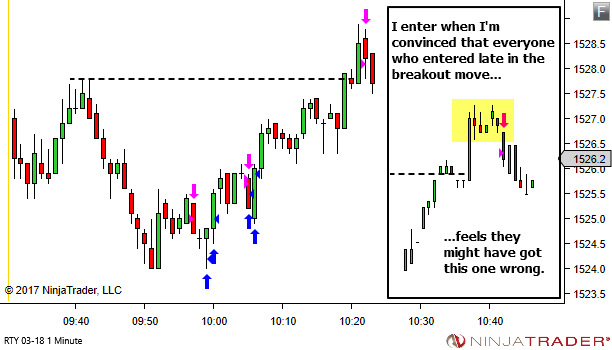 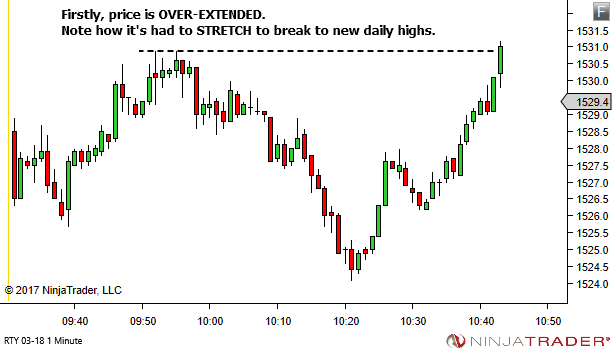 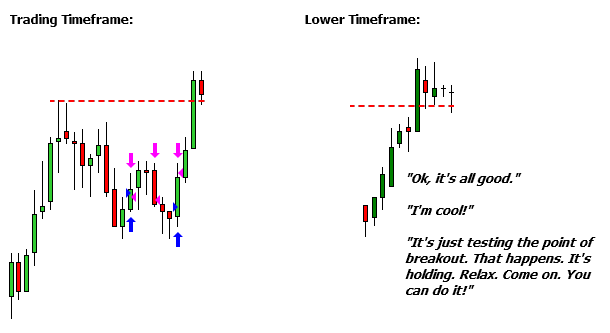 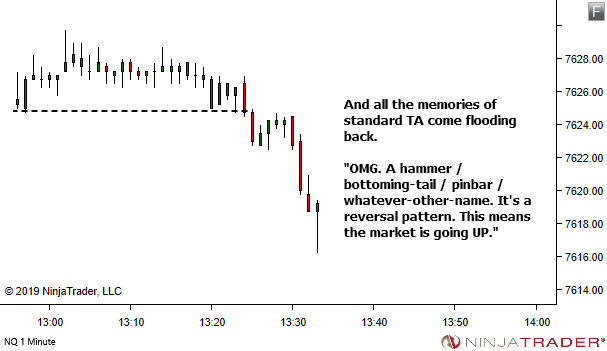 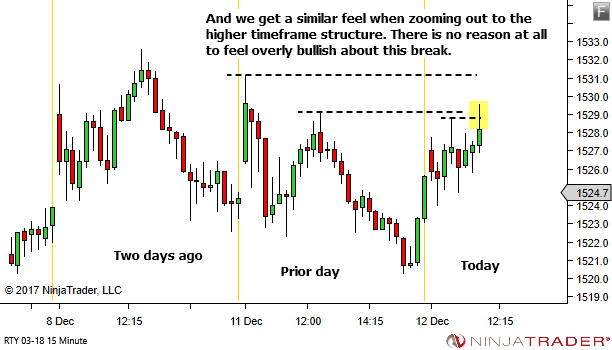 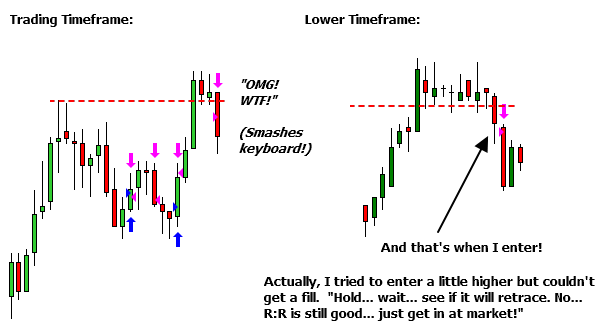 One of the ways I love to see this play out is through a Trading Timeframe (TTF) Narrow Range Bar. 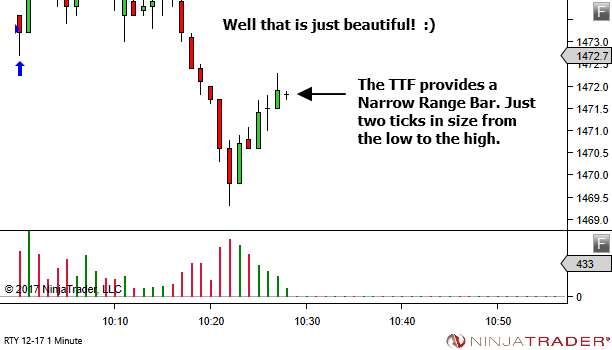 Please note that I am NOT advocating buying or selling the break of every TTF Narrow Range bar. 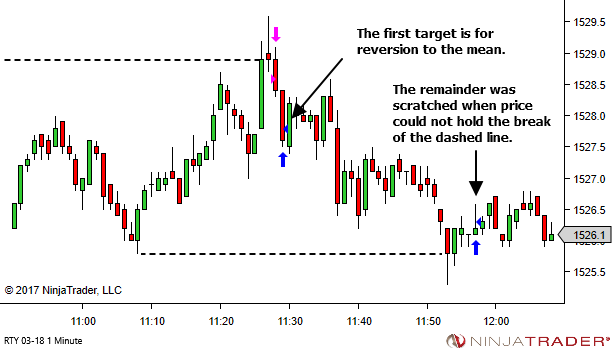 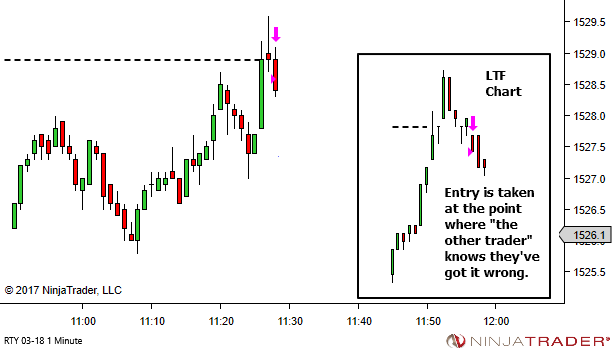 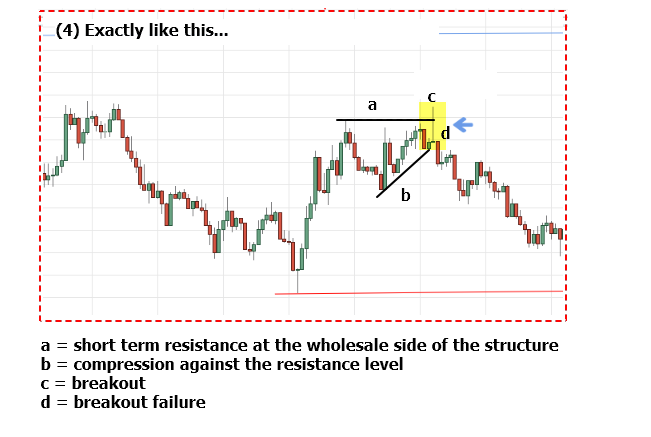 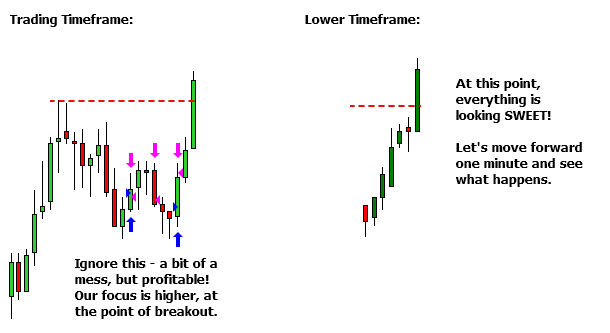 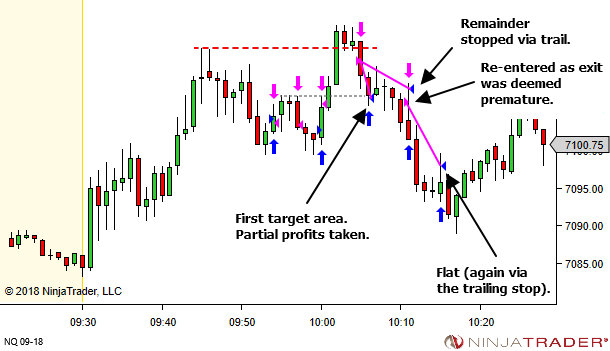 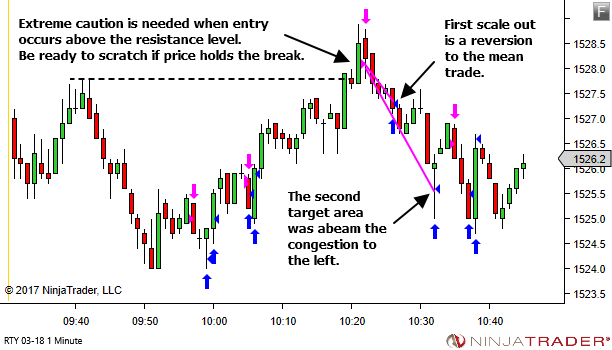 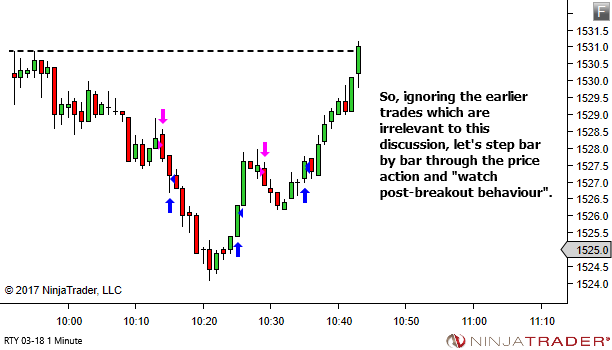 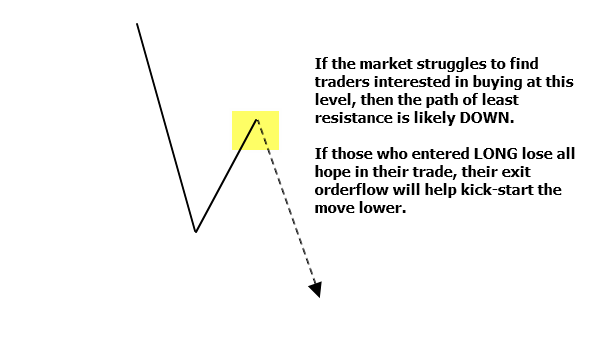 The trade must be in a proper setup location, where follow through in your trade direction makes sense with regards to the structure of the market. 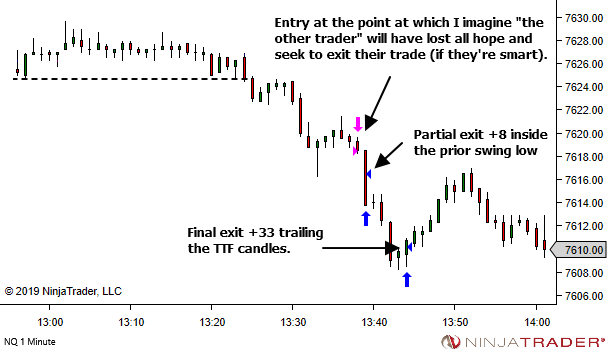 The trade must offer good reward:risk parameters. 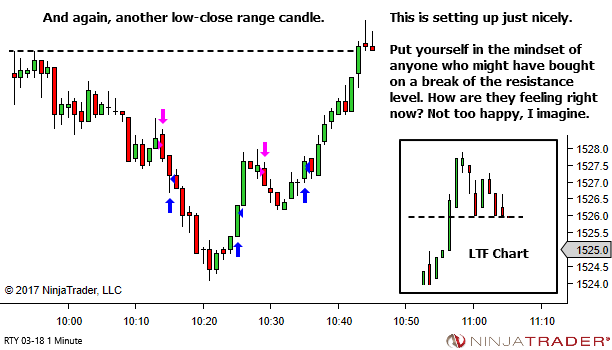 The Narrow Range bar entry will ensure low risk. 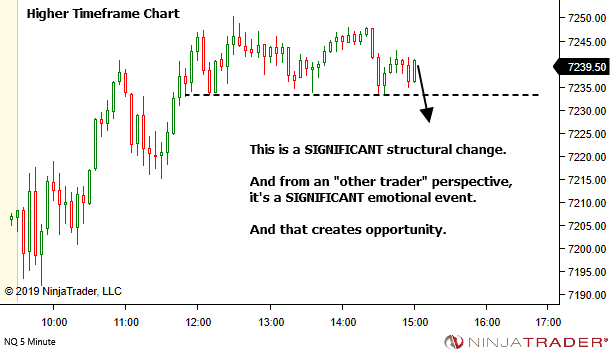 The market structure though, MUST provide multiple-R opportunity. 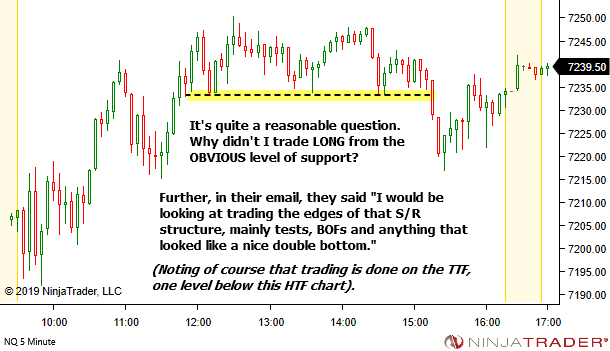 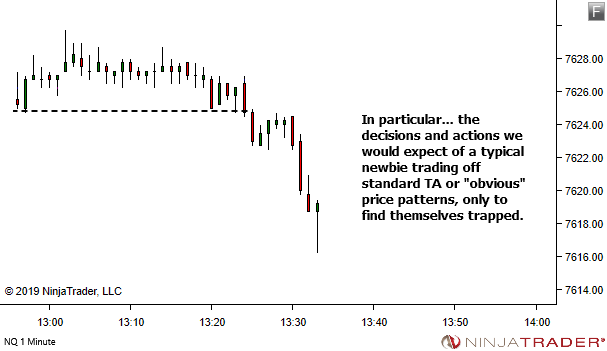 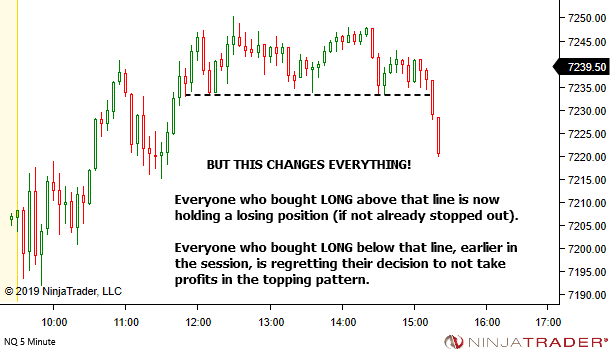 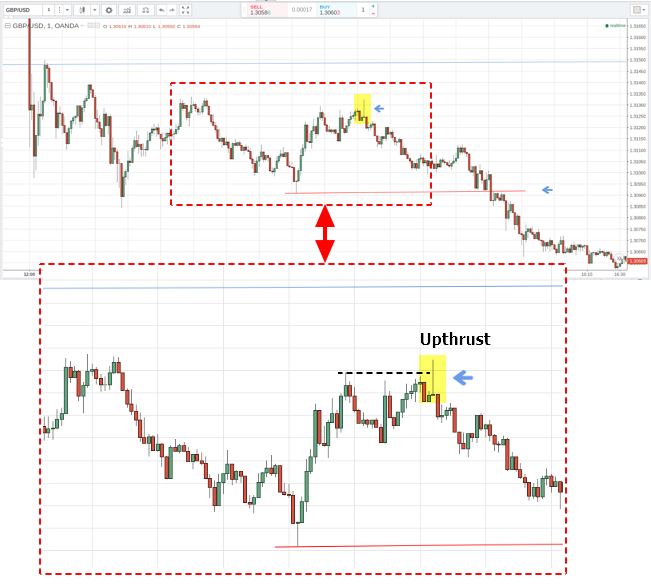 While trading and waiting for lower timeframe price confirmation… make sure to also keep an eye on the TTF. 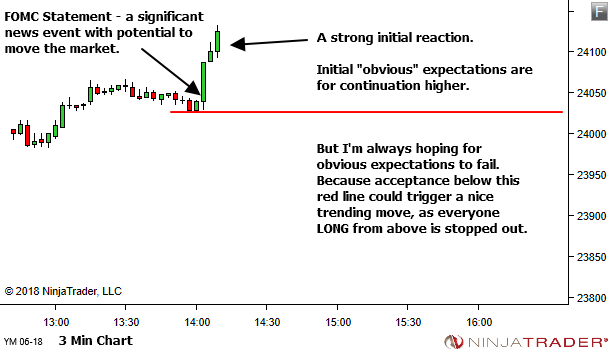 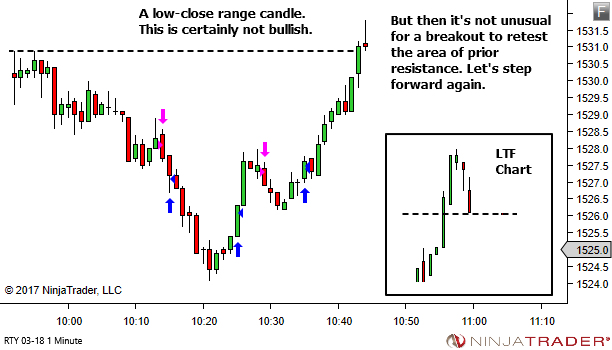 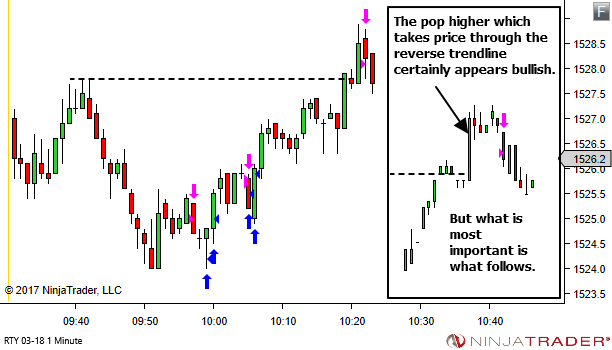 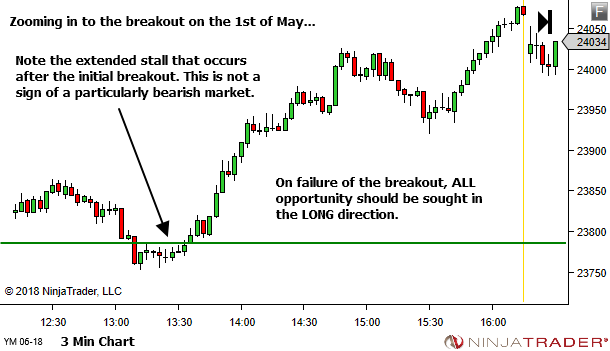 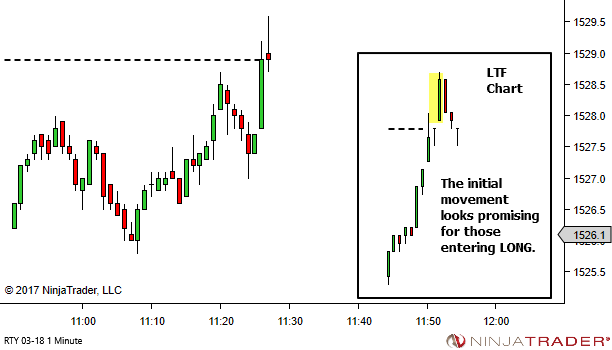 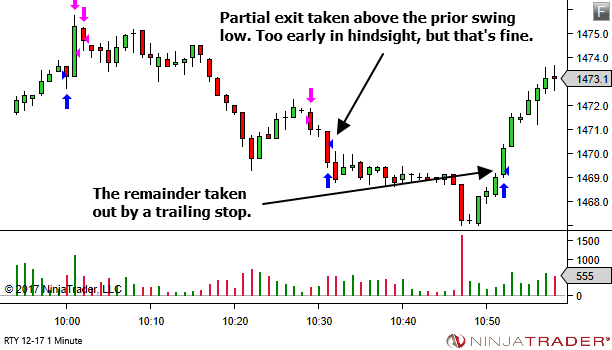 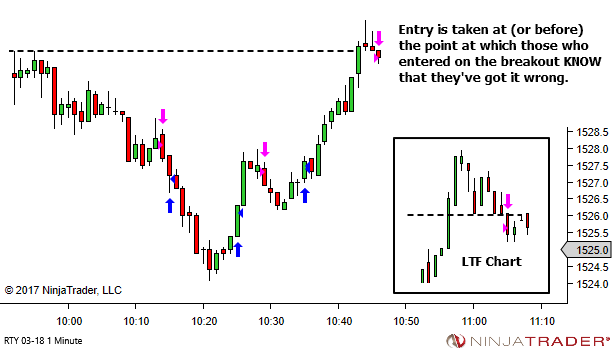 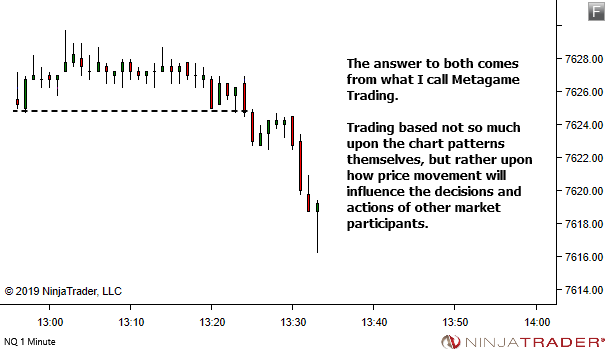 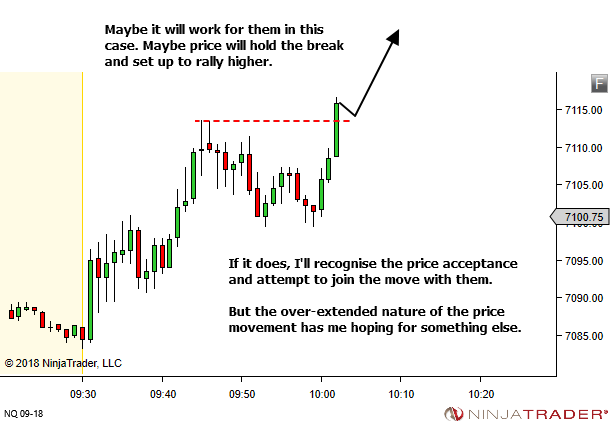 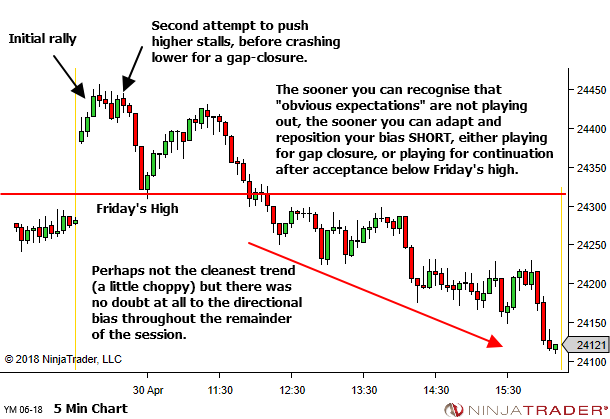 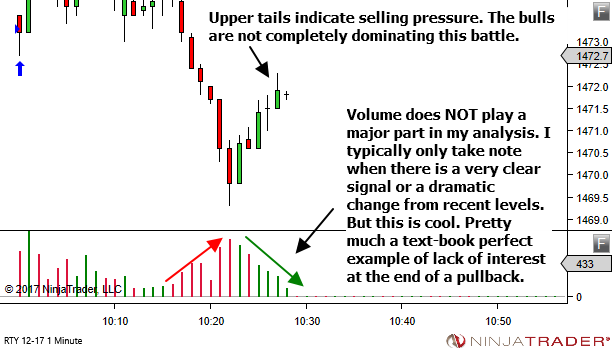 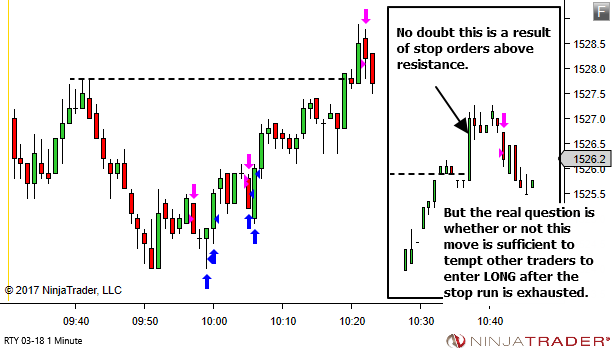 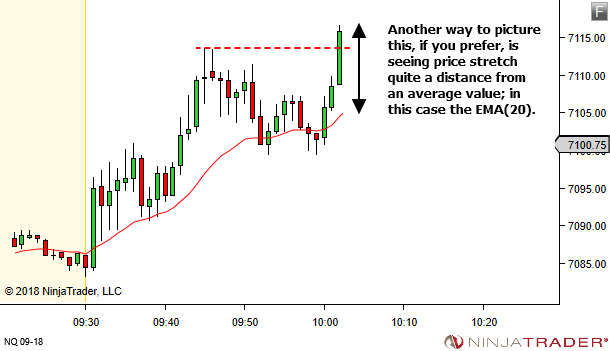 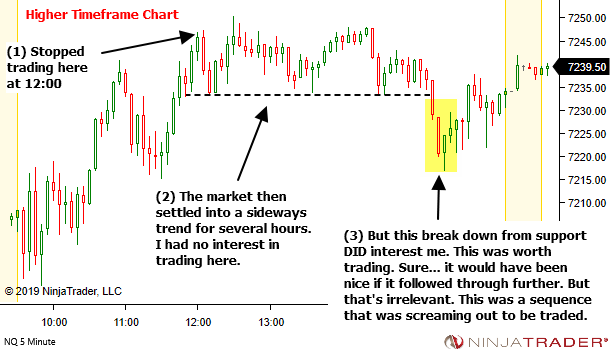 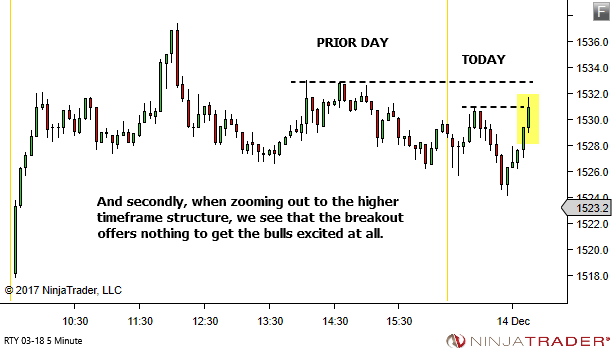 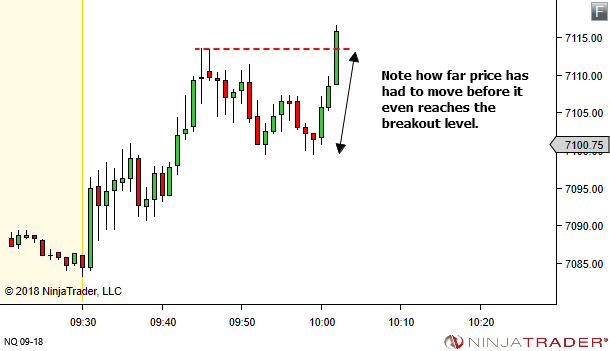 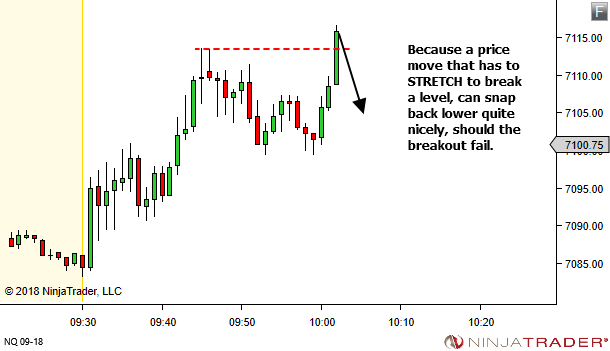 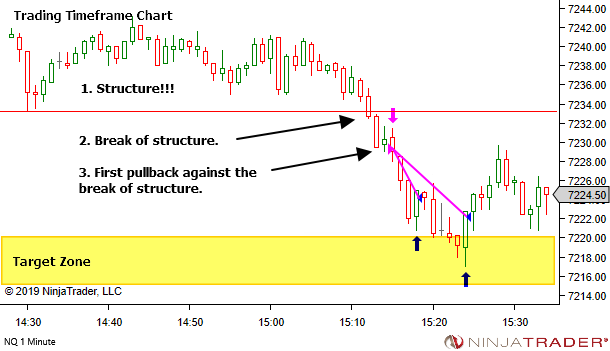 It may just be proving an inability to move further into your setup area, offering you a nice low risk entry into your trade.